It is very important to take good care of your sewing machine to keep it in working condition for the longest period of time. Follow the steps mentioned below & your sewing machine will stay healthy for a long period of time. Before you start to clean the machine make sure it is unplugged. This is for your own safety & also to prevent any damage to the machine. Cleaning your sewing machine is probably the biggest part of maintaining a healthy sewing machine. Clean the entire machine after every session of work. But if it’s not possible then at least clean the machine two days every week. Clean the bobbin case with the brush that comes with the machine or a soft cloth. It is better to put a drop of sewing machine oil on the cloth while cleaning the bobbin case. Use a small brush to clean the feed dogs after removing the throat plate. Put a drop of oil on the race hook of the bobbin after you have cleaned it. Compressed air can also be used to blow away any lint on areas such as tension disks. But never blow into your machine since the moisture from your breath can easily corrode the machine. Every time you clean your machine follow it up by oiling the required areas. Oiling helps in running the machine smoothly for a long time. It is advised that you use only sewing machine oil for oiling purpose. Take the help of owner’s manual while oiling the machine. There is no need to use too much oil. Just a drop of oil for every part is sufficient. After oiling is done, stitch a test cloth on the machine. This helps in preventing oil stains on clothes you would be stitching next. After cleaning & oiling the machine, tighten all screws of the sewing machine with the help of a screw driver. Don’t try to tighten or replace the set screws since they control the timing of the machine. That is the job of a professional. So if any set screw is loose or missing take your machine to a repair shop. 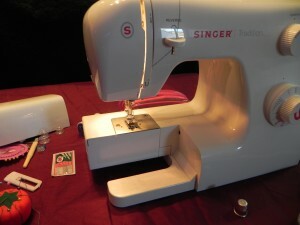 Maintenance of a sewing machine also depends on the way you use it. Always read the owner’s manual before you start using a new machine & everytime you face a problem with it. When you are not using your machine remember to keep it covered to prevent dirts from getting into it. Use the right kind of threads & needles for a project. Change needles regularly to prevent it from breaking while working. Even a slight bend in a needle can cause skipped stitches or cause damage to your machine. While winding a bobbin wrap the thread around the bottom a few times to secure it. Get your machine checked by a professional at least once every year.